Eliminate the guesswork and operator variability by switching to laser welding. Laser welding systems typically have 3 or 4 axes of CNC motion control to ensure accurate, repeatable joints. Additional motion control axes can be utilized for more complex weld geometries. Laser welding minimizes the heat-affected zone to prevent damage to packaged components or to the material surrounding the weld. Through laser process selection and tight production control you will see a constant weld depth and overlap, part after part after part. 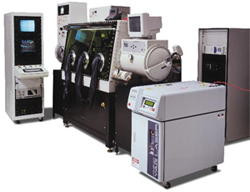 There are systems available for laser spot welding and laser contour seam welding. Welding is done under a shield gas or using a "glovebox" system to bake and weld packages in an inert atmosphere. The controlled process atmosphere ensures good weld integrity and allows devices to be sealed with positive pressure or vacuum. To optimize your laser welding project's success, the job shop will share their expertise in weld joint design and material selection during your design process. Proper joint design and material selection will ensure consistent, strong, crack free welds. While many other combinations of materials can be welded, using one of the preferred combinations of welding materials listed below would promote excellent laser welds. Moderate: Joint design and welding parameters are more critical for these combinations but they can still be welded fairly easily.